Updated Dec. 18, 2017, 8:00 a.m. PT: We can finally put the kibosh on any kind of rumor that Big Little Lies costars Reese Witherspoon and Laura Dern are feuding. Why can we do that, you ask? Well, as it happens, both Witherspoon and Dern connected on Twitter recently to brainstorm some adorable and unconventional Big Little Lies Season 2 ideas — and we’re living for it. Of course, Dern saw an easy way to bring the worlds of Star Wars and Big Little Lies together, and she didn’t hesitate to pitch her idea to Witherspoon right away. “Um…yes. Easy. Renata just bought the real BB-8 for Christmas for her daughter. Knowing u would likely get your daughter the toy!”. Um…yes. Easy. Renata just bought the real BB-8 for Christmas for her daughter. Knowing u would likely get your daughter the toy! OK, this idea is actually amazing and yes, now I will need Amabella to get a BB-8 in Big Little Lies Season 2 or else all will be for naught. 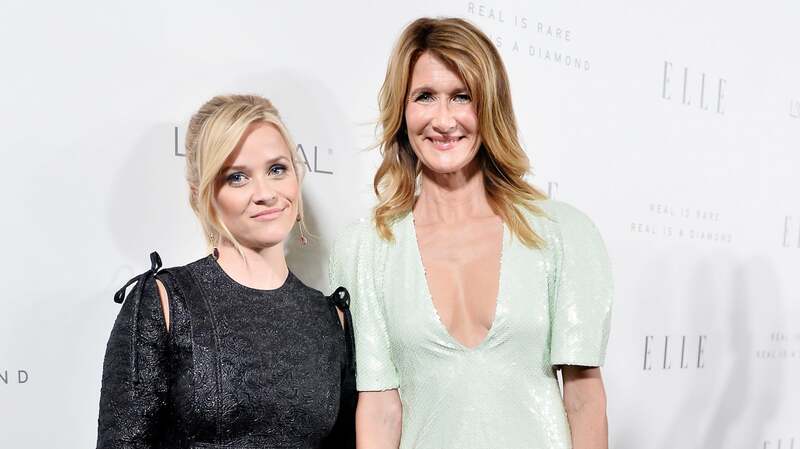 Original story, published Sept. 18, 2017: The internet seems to think that something is brewing between Big Little Lies stars Reese Witherspoon and Laura Dern, and it’s not at all friendly. This is, of course, speculative and incredibly problematic to say the least, if only because the speculation is looking to pit two women against one another for no good reason. Because Dern didn’t embrace Witherspoon and suddenly that’s a sign of a feud? It sounds fishy, folks. Speculation began brewing on Sunday night at the 69th Primetime Emmys when Dern skipped over Witherspoon as she received congratulations after winning Outstanding Supporting Actress in a Limited Series or Movie. When Dern was announced as the winner, a curious thing happened: She passed right over Witherspoon. More: Is Big Little Lies Season 2 Actually a Good Idea? It’s traditional during an awards show, especially one like the Emmys or Oscars where big groups related to a project show up, that the winner might take a moment to get hugs and kisses from their dates or co-stars before going up onstage. Considering the established narrative of how close the women of Big Little Lies are in real life, to see Dern get announced as the winner and move right over Witherspoon to Nicole Kidman (seated in front of Witherspoon) is interesting and noteworthy, but it’s not exactly damning proof that Dern loathes Witherspoon, is it? There are a few reasons right off the bat that there’s no smoke, no fire and lots of unnecessary internet chatter about this. First off, Dern’s nerves may have gotten the best of her. There’s a chance she just kind of quickly hugged the first people she saw before making her way to the stage so she could give her proper thanks. Second of all, there’s a chance that maybe Dern and Witherspoon are cool but perhaps they just don’t show their affection for one another in that way. There’s also reason to believe that the cameras focused on Dern after Witherspoon acknowledge her and congratulated her. Listen, at the end of the day, there’s most likely nothing here; the internet is talking about a problem that simply isn’t there. There’s no need to blow something entirely out of proportion — however interesting or somewhat shady it may be — when it could risk painting two women whom we otherwise love and who have not been prone to catty behavior in public before this with a broad brush.